Mal from Queensland had obtained our phone number from Josh whom we were planning to transit with on the 23rd. He only called yesterday needing one linehandler but of course we are a team! We are not sure yet how Josh got our number but we think it was from signing up with panlinehandlers.com. 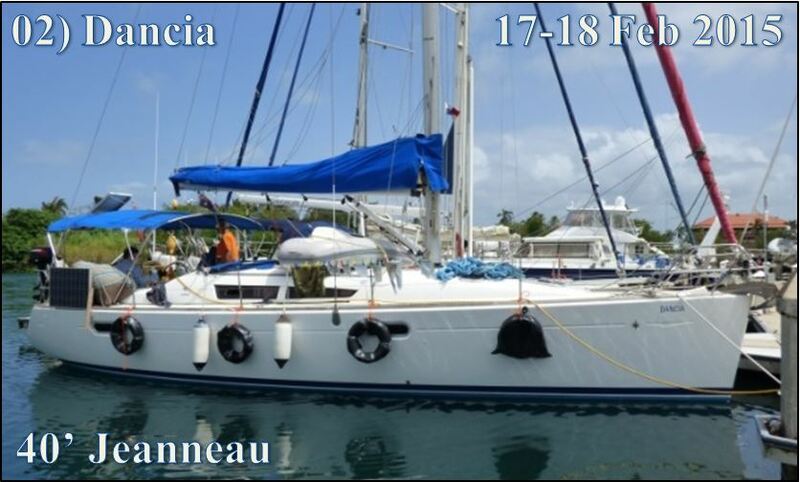 Mal and Carol bought Dancia as an ex-Sunsail boat in the Caribbean and are heading back to Australia slowly. Mal has done all sorts of boat jobs and Carol was a nurse. We left the apartment at 09:10, caught a cab and were sitting in a bus by 09:30, hoping that it was actually going to Colon! By 10:05 the bus was full and we headed off. At least the TV wasn’t set to deafening this time. Soon after we left a guy was selling snacks and water, then some hippie stood up and was selling books about alternative medicine. Luckily we both had mp3 players. The bus price was $3.70 which is amazing for a 90 minute trip that crosses a country. It was completely full but most people were dropped off along the way so it was us and another gringo at the end. At Colon the taxi driver we spoke to didn’t know where we were going and showed us his price list. I couldn’t find Shelter Bay but I told him that it was normally $20 and he agreed. We gave him $25 because we were so happy not to be ripped off this time Colon! Next time I think we will ask for San Lorenzo. At the marina we found Carol on Dancia and were invited on board. Chatted with her a while then Mal appeared. Both of them are very laid back Australians, originally from NZ. We were also joined by Chris and Sue, two older Brits from the Isle of Wight who are crewing on yachts. They had recently been through the Canal as well. We got away from the marina by 14:00 to wait for the Advisor at the Flats. He was due at 16:30 but only showed up around 18:00. 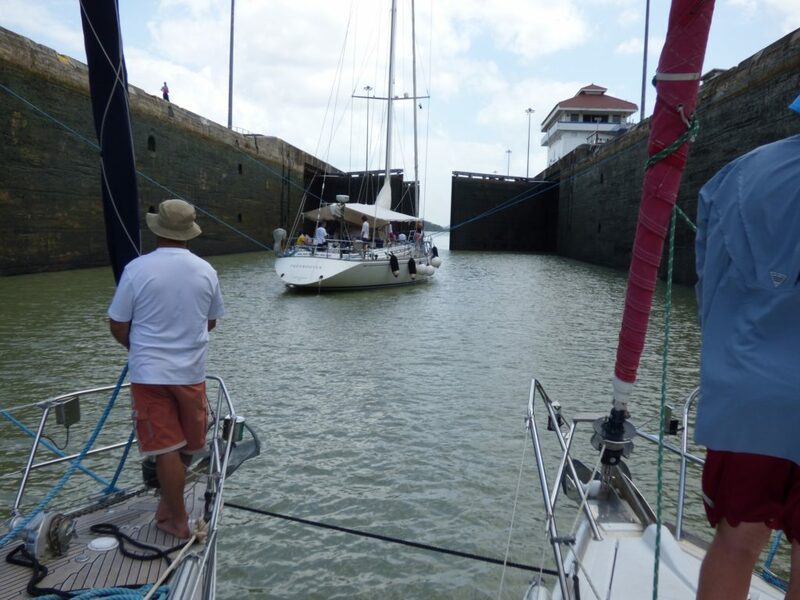 Luis jumped across with no problem, and quickly told us we would raft with another smaller yacht, and share the locks with a chemical tanker. So much for not being with dangerous cargo! Luis was quite young, but with ten years as a master mariner he was now one year into a Canal Pilot program. He had excellent English, and was much calmer than the guy we had last time. Carol insisted we have a couple of beers during the wait, and then we slowly set up the ropes. 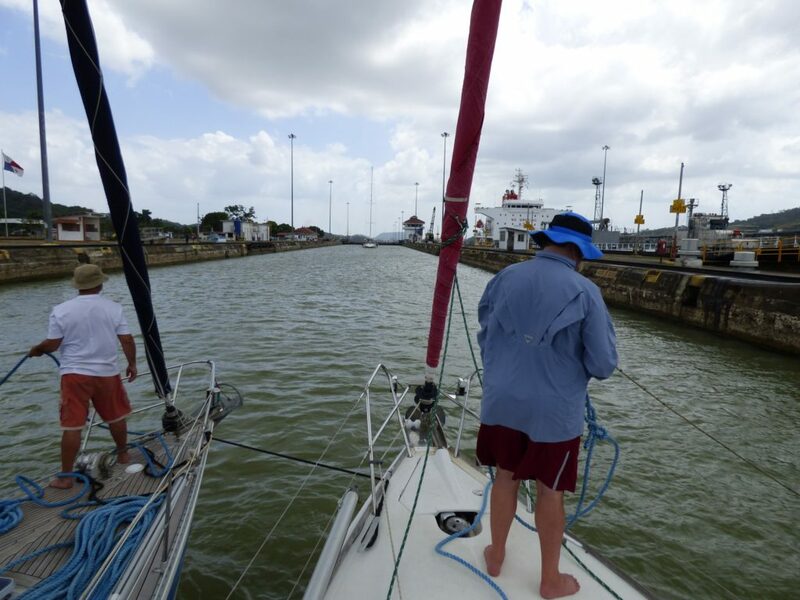 At 18:35 we picked up the anchor and tailed the Trans Trader towards the Gatun Locks. Mal was treated to his stressful moment of the day when Carol was digging in a stern locker and something fell on the steering cables. It was quickly solved and Mal was very cool about it. The second yacht was rafted next to us by 19:30 and we moved towards the first lock. Amazing to see the currents coming out of the lock, apparently the salt water pushing the fresh water out. Things then went quite quickly. 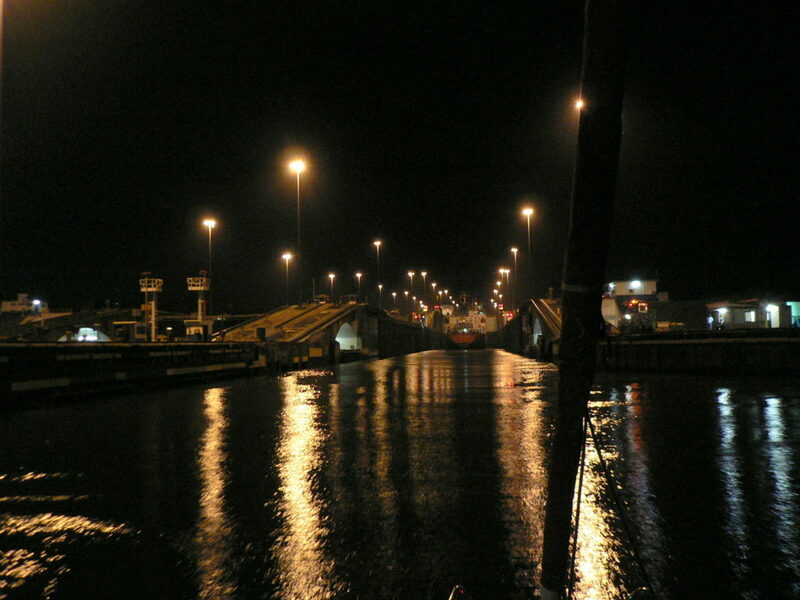 Two of the locks were filled on the fast setting so they took around eight minutes to fill. The boiling water was more dramatic with whirlpools forming, and lots more movement of the boat. At 20:45 we were on our way into Gatun Lake, and by 21:15 we were tied to the buoy. We all had a few drinks then went to bed, ready for tomorrow’s early start. We were in a quarter berth under the cockpit so it was a contortionist act to get in. It was really hot with no breeze other than a little fan, and only a small porthole opening into the cockpit. We got a text today offering a transit on the 21st but it is on a 35 footer which is getting a bit small! We were woken by the engine at 05:50 but the Advisor wasn’t on board till about 06:35. We got underway for the trip across Gatun Lake, with tea and breakfast appearing soon. Luis (a different one) was chatty and informative. He used to work on big ships, and now works on the tugs as a Captain. Going through on yachts is like a secondment. I told him we had talked to Roland about getting on a tug and he said he would try as well. Luckily we had a bit of cloud cover in the morning but it was still hot. 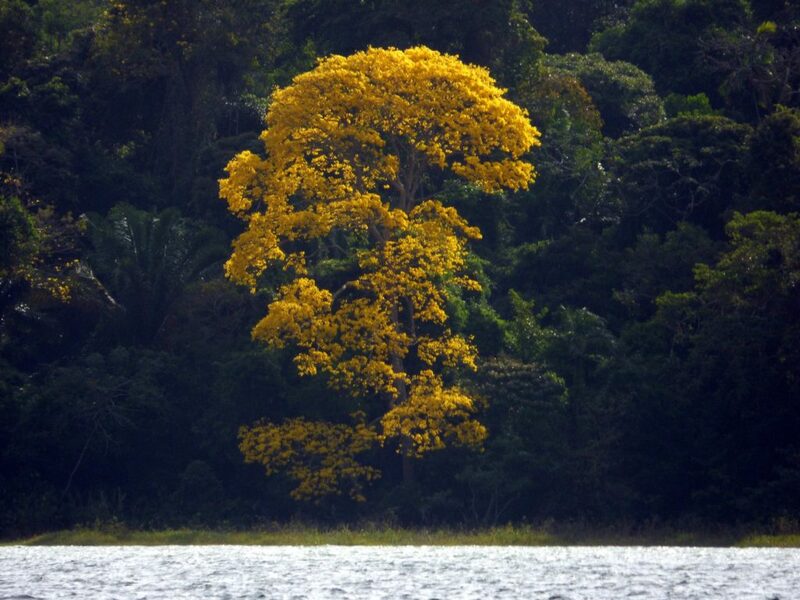 We saw a huge crocodile lying on a beach, and Luis told us the brilliant yellow trees were guayacan that only flower for two days every year. We got to Pedro Miguel by 11:15 but had to wait for a couple of ships to come north. It was around 13:30 by time we got into the lock, this time just two rafts and an 80 footer. 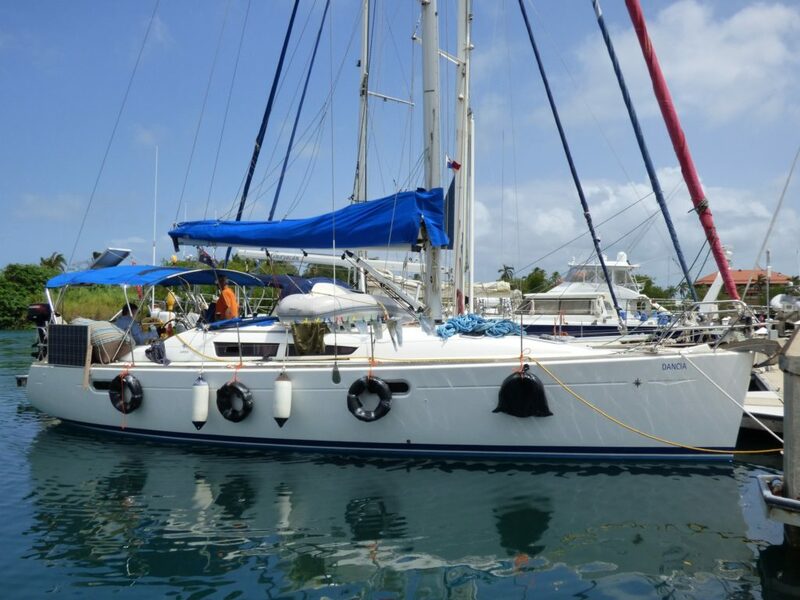 The big one had hired linehandlers – we would definitely like to get on a yacht like that! There was a Dutch couple on the yacht next to us who asked if we would join them in mid-March to go through but we will be in Vegas. At least it seems we can get trips by putting even small feelers out. Down-locking went smoothly enough, even with the guys on shore missing a couple of heaving line throws, and a strong tailwind making our mismatched raft a bit unwieldy. We were 40 feet and Kairos was 29 feet. The smaller boat looked rather crowded but the solo sailor on there seemed to be enjoying the company. 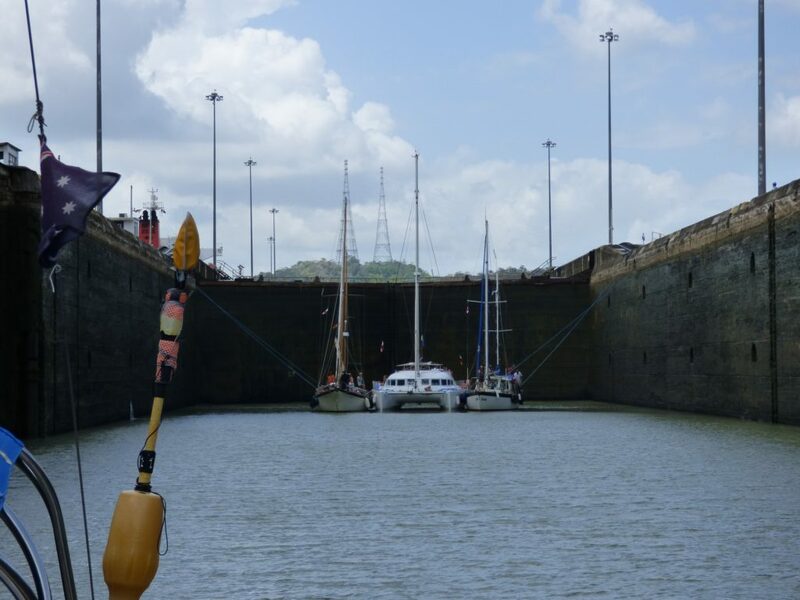 We were out of the last Miraflores lock around 14:30. Mal pulled alongside the fuel dock at Balboa Yacht Club and we were home by 15:30 to fall in the pool and enjoy a cold beer!